In a recent talk before a local business group, I exposed 10 myths about mortgages. One of those rises to the level of being a myth about personal finance in general: "It is always better to pay off a mortgage early." A related misassumption might be "Don't refinance." These ideas, while emotionally comforting, are financially questionable. In fact, there are persuasive arguments show they are unsound. Refinancing rather than paying off a mortgage trigger numerous fears and frustrations: that refinancing means starting over; that you've thrown money away; that you'll never get to the finish line; or that you've handicapped yourself by becoming more indebted to a bank. For the purpose of this brief email, I'll offer three examples that illustrate some of the dangers of paying off a mortgage. 2) There is a constant stream of clients who have $20,000 or more in credit card debt at rates at 14% - 28% while their mortgages are in the 5%- 6% range. They’re convinced they will pay off the credit cards without touching the equity in their homes. Unfortunately, in my experience that’s rarely the case. Credit card interest payments sap their cash and because they typically continue to use the cards they never catch up. Increasing a mortgage doesn’t increase total debt if the money is used to pay off credit card debt. The immediate gain is the lower interest payment, an advantage magnified since the mortgage interest is tax deductible. Plus there is a huge emotional benefit beyond saving money: it feels great to get that horrid burden off your back. 3) I often hear from clients who are reluctant to refinance that they refinanced during the past few years and believe refinancing means they wasted money. Here's the simple truth: what's done is done. 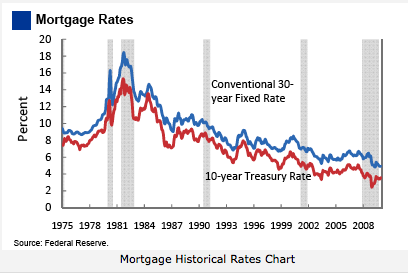 All that matters in the analysis is this: would you be better off today with a better loan? If so, then take advantage. 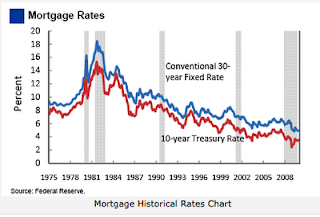 Mortgage rates are at historic lows (see the attached graph). The consensus among economists, bankers and politicians is that they are unlikely to remain low for long. So lock in a new rate today, save money – then invest the proceeds to buy gold or stock in Apple. For more myths, subscribe to my blog and get regular posts on all things related to the world of real estate finance.